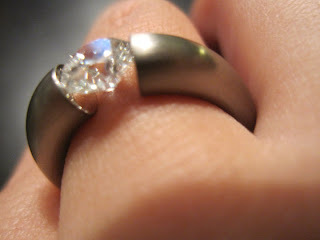 Scott and I have a great group of friends here in Chicago and recently, two couples have gotten engaged. Between the two of us, we know several couples who are currently in that fun stage called wedding planning. Now that our own wedding has passed, I often find myself bestowing advice to engaged ladies (and hoping I don't come off as a know-it-all). The number one thing I end up saying is, "Don't worry, it will all work out" (which we all know is easier said than done). But in the end, you realize it really does all work out. All the planning sets the big day in motion, and then the bride and groom's only job should be to live it out and enjoy every moment. 1) Stay organized. Keep all your vendor invoices, magazine pictures and other inspiration in a big binder. Since you can't tote the binder everywhere, tuck a little notebook in your purse for random thoughts, vendor contact info, and note-taking while making calls on-the-go. Track down a timeline/checklist that you like and reference it every few weeks to make sure you haven't forgotten an important task. It also helps to look ahead and know what is coming so you can manage your time. And nothing feels better than checking something off that list! 3) Don't overwhelm yourself with choices. There are a million options every step of the way. Pick a couple good options and go with one. Make an informed decision and try not to second-guess yourself. For example, if you are deciding on a florist, pick two or three florists you have heard great things about, meet with them, and then choose one. If all two or three are great, you can't go wrong! 4) Plan certain weekends to be "wedding planning weekends" so you can feel productive and get a lot of the time-consuming tasks done. My planning weekends were the times I flew home to Kansas. I set up a bunch of meetings ahead of time and made a schedule with plenty of errands and lots of downtime too. An added benefit to this system - you won't feel guilty if you relax on your time "off". I think those are the big pieces of advice I have... Now I am off to a bachelorette party! As a bridesmaid, I can't wait to shower the bride with lingerie, partake in some delicious cocktails and dance the night away! 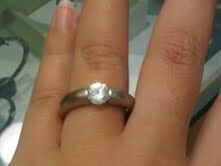 Sparkly diamond in a tension setting - congrats to E and B! 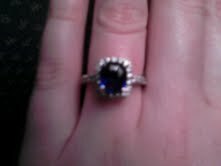 Beautiful sapphire surrounded by diamonds - so happy for C and M!